I have been meaning, meaning to take pictures of this since our local hardware store put them in the window a month ago. Finally, I remembered to grab my camera before taking the dog for her Sunday evening walk. Blurry, yes, but I think you get the picture. Are they supposed to herald the coming of autumn? Symbolize the waning summer sun? I was in the car at the time, so, props to my eyeballs for catching this out of the corner of my eye and equal props to my quickdrawl hands. Taken, somewhere in Cambridge, sometime last week. This amuses me to no end. In fact, I'll leave El Stinky Pants in there until I get to see the full smooshy face effect. Yes, I am a good mother. Ah, glorious Ollie in all of his glorious glory. Actually, I'm not blue. How could you be with this little bubba-labum? I've been abysmal at keeping a baby book for Stinky Pants. Maybe this will work? Ollie, I love your teddy bear hat, and I don't care who knows it. Unfortunately, your head's getting too big for your ear flaps. I don't think we'll make it through the season. Luckily, you still have your booties. Your fabulous, fabulous bootays. As much as I love to dress you up in your ear flap hat and your flamboyant booties, it's time for your nap. Mommy's going to kick back with the Gilmore Girls, now on E4. I loves you E4, and I loves you More4 for bringing back ER. 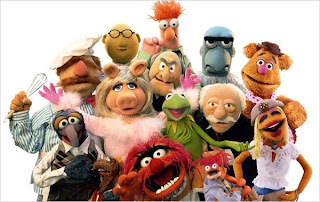 The Disnifictation of the Muppets or "Say it ain't so, Walt!" Clealry, I will have to buy Stinky Pants all the classic Muppet Shows because who knows what Disney will do to them...How do you recreate the hilarious Swedish Chef or Pigs in Space for viewers in the Disney-verse? I don't think it will ever be as funny or as subversive. Oh, Jim Henson, how I miss thee. Speaking of you, Stinky Pants, how you love to be thrown into an old pillow case and flung around the room by your daddy! Ah, we are easily entertained. We drove two hours to a beach with no beach. Nice little high street with pretty little boutique-y shops. But, man, with the dog and the baby, it's not like we had a chance to see very much. 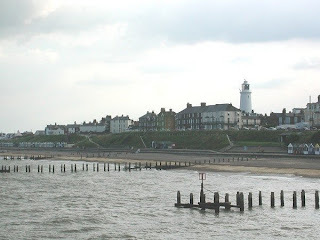 So, that left a meal on the pier and a quick high street drive-by which amounted to "Oh, pretty coffee shop. I think. Hey, don't drive so fast!" Okay, CNN playing the whole "Sarah Palin Unveiled" or whatever. I can't write pithy comments on the Suffolk coast. Book banning whackjob. Well, mainly, that North Dakota is right up there. See it? It's right by Canada! Canada. Huh, go figure. I had it wedged in the middle of Ohio and Indiana and Tennessee and West Virginia. Basically, I thought it was Kentucky. Or I thought Kentucky was North Dakota. Rejoice! It is fall, my much beloved season of seasons. It is Halloween and Thanksgiving and pretty leaves and the beginning of cozy sock wearing and crock pot cooking. Most happy of sighs. When you're an expat, you find there are some things you miss about your country and other things you miss, well, not so much. I suppose things falling in the not-so-much category would be the ever-present-in-your-face flag waving. Like you aren't really an American unless your business/place of residence is covered, tip to toe, with American flags. And what's with the "American Owned" thing? Why did they feel the need to advertise the fact? What are they really saying, er hum? I sometimes find American patriotism to be cloying and dangerously nearsighted. 1. 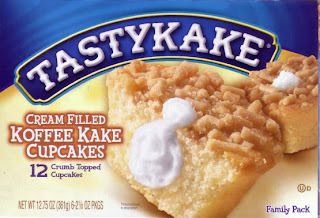 Tastycakes! I was particularly partial to the Cream Filled Koffee Kake Cupcake. Oh-la-la. 4) Italian Delis. God, I sorely missed these, even when living in DC. Growing up, you never realize that a town or city could exist without a proper Italian deli. Yet, they do. And we're the worst for it, really. STATION BREAK, PART LE DEUX, or, CAN JACKI THINK OF SOMETHING SHE MISSES THAT IS NOT FOOD RELATED? Er, um, friends? Family? Oh, I know...! Le Target. Sing unto the angels!